The Stables is a beautifully converted building, which we use for our Autumnal Craft Retreat. It is spacious and modern inside, with ensuite bedrooms available. There are plenty of lovely walks on the door step, with the RSPB reserve just a walk away. Surrounded by farm land and a beautiful stretch of river -perfect for a relaxing week. 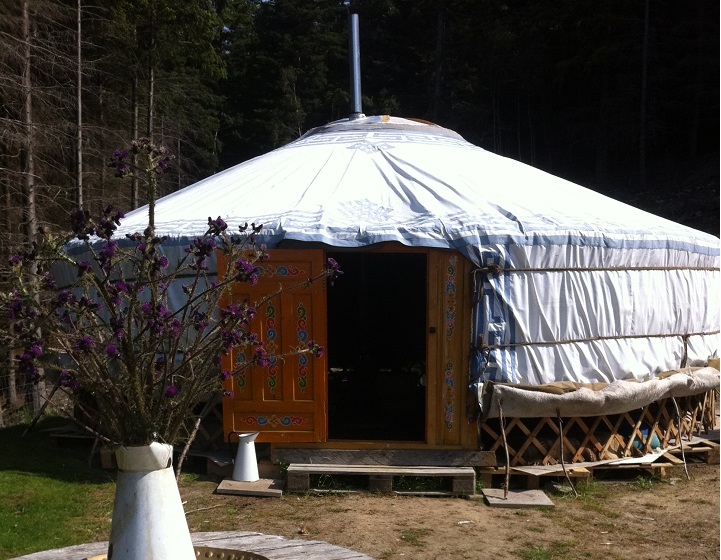 Stay here in Crochail woods, in the yurt if you fancy a bit of an adventure! The yurt has its own secluded spot in the woods, it has a double bed as well as a pull out futon, so can sleep 2 or up to 4 if you are happy to share. It has a wood burner and gas to cook on, there is also an outdoor compost loo and a solar shower. It is the perfect get away for those looking for something a little different. 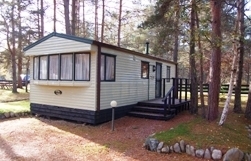 Glen Affric holiday park, is a friendly welcoming place run by Alan and Amanda. The holiday chalets, sleep from 2-6 people and have all been recently re furbished. The chalet park is in the village of Cannich, which makes it a great location if you travelled by public transport, as it is in walking distance of the shop, pub and cafe and you can get a bus to the door! A super place to spend a long weekend or a week with family or friends. Set amongst 6 acres of mature scot’s pine and birch trees and recommended by Ray Mears, this is a gem of a campsite. There are 3 grades of static caravan holiday homes available, as well as pitches for touring caravans and tents. Facilities include hot showers, a laundry, TV room, wifi and bike hire. Their excellent cafe serves homemade food and locally baked produce, and has an excellent monthly pop up restaurant. 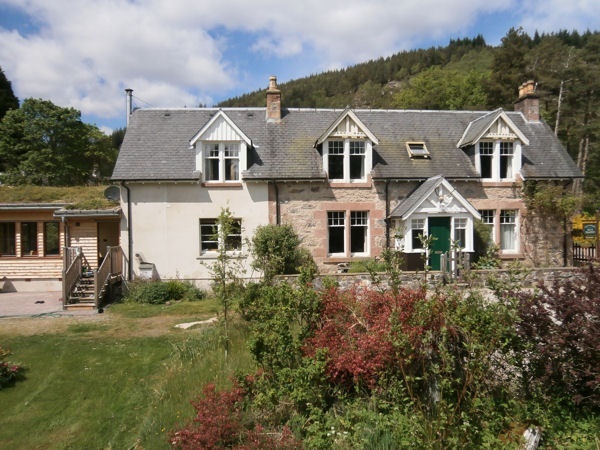 Westward Bed and Breakfast is a friendly, family run B&B, a traditionally built Highland home, set within the village of Cannich. The house retains many of its original features and the pine linings throughout give it a lovely warm atmosphere. It is especially handy if you are travelling by public transport, as it is right in the centre of Cannich, which has a cafe, pub and the village shop in walking distance. Kerrow house is a few miles down the road from us here in the woods. Liz and John are very welcoming hosts and run a fantastic B&B. They also have self catering cottages which sleep from 2-7 people. We use the Stalkers wing of Kerrow house for our Fleece to Felt and Dye to Spin weeks. Kerrow house has lovely walks all around it as the river Glass runs right in front. Set amongst 6 acres of mature scot’s pine and birch trees and recomended by Ray Mears, this is a gem of a campsite. There are 3 grades of static caravan holiday homes available, as well as pitches for touring caravans and tents. Facilities include hot showers, a laundry, TV room, wifi and bike hire. Their excellent cafe serves homemade food and locally baked produce, and regularly hosts live music events in the evening. Shenval offers lovely accomodation with a warm welcome from Pierre and Christiane Lebrun. 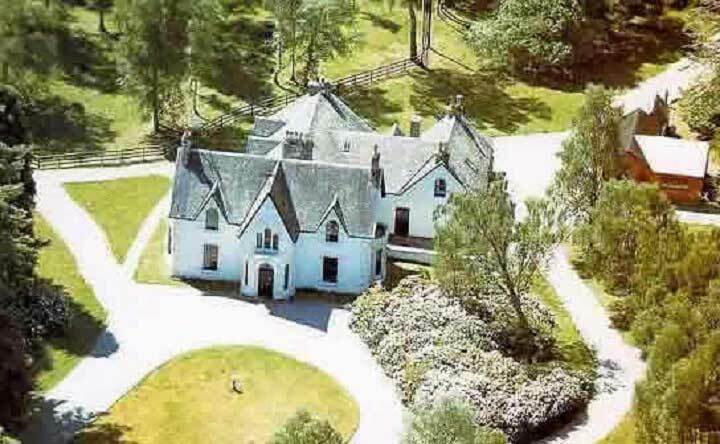 It is surrounded by a beautiful garden full of wildlife, with pastures, woodland and heather-clad hills beyond. The food is excellent, much of it is organic and vegetarian and special diets can be catered for. Evening meals are available by arrangement. 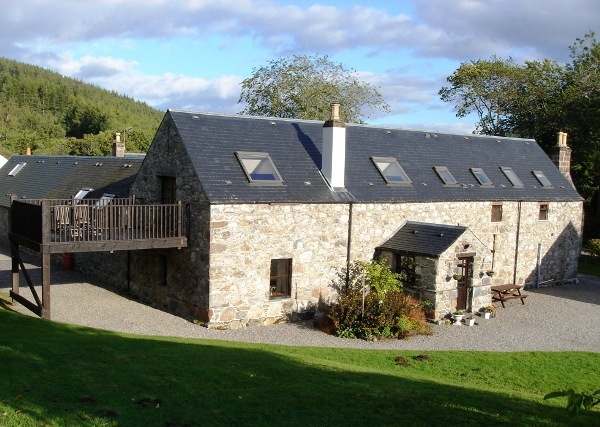 The Steading is the perfect place for our relaxation weeks. This old building has been beautifully renovated. There is a wonderfully spacious living area with a woodburning stove, five bedrooms, one with a four poster bed and a modern well designed kitchen area. There is plenty of outdoor space and even a snug second sitting room on the second floor.